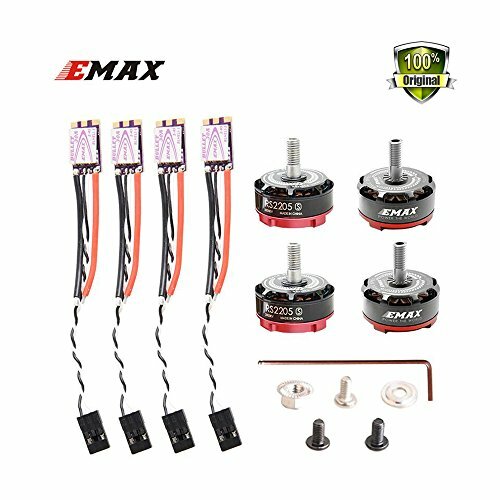 The new standard of EMAX RS2205-S 2300KV Brushless Motor is to have all four motors tighten clockwise.The completely redesigned RS2205-S is upgraded with features racing multirotors absolutely need. The motor is lighter, yields faster bell rotational response, higher thrust, uses premium materials and backed with EMAX's legendary production quality. Compared to the RS2205, the new RS225-S cranks out another +100g of thrust. RS2205-S 2300KV:N52SH Double side arc shaped magnet,new stator design with precision winding of the wire increse 10% magnetic field intensity. Bullet 30A ESC:Imported MOS tube, Japanese ceramic capacitors, 3oz High-TG PCB board, significantly reduces electrical heat soak and improves system efficiency. Lighter and Lower Profile: The bell has been redesigned to have a lower profile without sacrificing the structural integrity of the motor. By utilizing N52SH curved magnets, the pulling force between the stator and magnet is greatly increased. Compared to the RS2205, the new RS225-S cranks out another +100g of thrust. Paired with a KingKong 6x4 propeller, expect over 1,400 grams of thrust . No more E-Clips. With a retaining screw, RS2205-S has no chance of having bells pop out during a race.